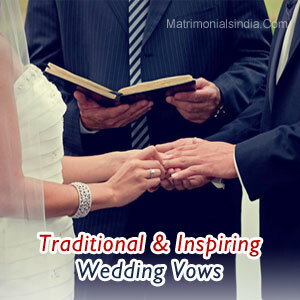 We wish your wedding vows never turn into wedding woes and in this blog we are going discuss the significance of the traditional and inspiring vows. These vows are personal and these are special too, and there is something more than what meets the eyes. In Hindu marriages these are taken while treading around the kindled fire, and in Christian marriages these are taken before the figurine of Lord Christ. The bride or groom promises his or her partner that he or she would stay with his or her partner in every good and bad situation, till death does them apart. The bride/groom accepts his or her partner as a constant friend, loyal partner, and a lifelong lover. He or she takes the vow that one would not abandon his or her spouse during sickness, sorrow and bad times. A promise of unconditional love is made along with the promise to support the other in his or her goals. The groom/bride promises to respect and cherish the significant other, and laugh and cry together till both are alive. The person commits to grow old and fall in love with the significant other a little bit more every moment and every day. The bride/groom accepts to make the family of the significant other as his or her own family. He or she also takes the vow to be buried at the same place where the other would be after death. You can also write your own heartfelt vows for your wedding. It is a great way to personalize the weddings and tell it to the world that how much your love your lovely wife or adorable husband. The vows taken at the time of marriage make the weddings sacred and strengthen the relationship because these are taken publically and before the divine god. You don't need to turn into a poet or a philosopher to write a vow, write from your heart and it would surely touch the heart of your special someone.